(CLEVELAND) — As a star student and a promising athlete at her Mississippi high school, with college ambitions, it seemed that the sky was the limit for then-17-year-old Katie Stubblefield, her father said. But amid the stress of looking at colleges and looking ahead to graduation, the teen’s life took a detour. Now, four years later, she has a different story to tell — one that describes the emotional struggles of adolescence, the permanence of split-second decisions and how two troubled souls came together to create a second chance. Years before that history-making procedure, she was experiencing a stressful year. The high school senior was suffering health problems related to an appendectomy. Both of Katie’s parents had lost their jobs, teaching at her high school. “I think really with Katie, she absorbed it, and it hit her deeply because I was her teacher,” Robb Stubblefield said. Then on March 25, 2014 , Katie’s boyfriend broke up with her. Angry and upset, she left school early and drove over to her older brother Robert’s house. Katie’s mother, Alesia, had been out with a friend and was dropped off at Robert’s house. She tried to comfort her daughter, but Katie didn’t want to talk. Robert and Alesia went outside to talk to Alesia’s friend, when Robert said it sounded like a door slam. They went in, and the bathroom door was shut. Katie was on the other side. In an impulsive teenage instant, Katie had taken her brother’s hunting rifle, put it under her chin and pulled the trigger. Not knowing if she would make it, doctors began reconstructing Katie’s disfigured face. 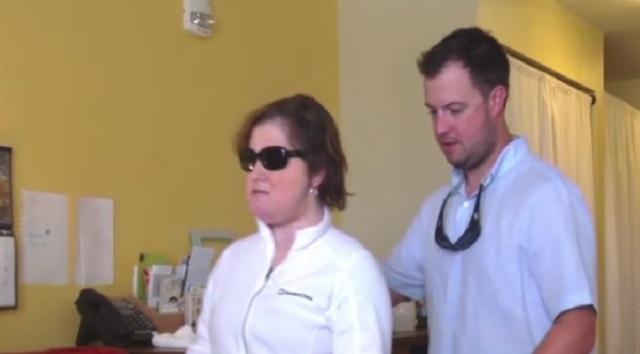 From the first night she was brought into the hospital, Robb Stubblefield said the trauma surgeon told them a face transplant would be her best chance at normalcy again. Cleveland Clinic is where the first face-transplant surgery was performed in the U.S., led by the hospital’s plastic surgery chair, Frank Papay, in 2008. The team has learned a great deal about this type of surgery since then. Before Katie’s case, the hospital had performed two other face transplants. Gastman was part of the team that performed Cleveland Clinic’s second face transplant. He said Katie’s not the first transplant patient who had attempted suicide. When Katie first arrived in Cleveland four years ago, she and her family moved into the Ronald McDonald house to be close to the hospital for Katie’s constant care, including more than 17 surgeries before her face transplant. For one of those operations, doctors made a 3D model of Katie’s sister’s jaw to help them reconstruct her face. Katie could have survived with the face the team was able to reconstruct for her, but she wanted to feel normal again, even if that mean risking serious complications — or even her life. The day before Katie’s operation, the surgical team, made up of more than 50 personnel including 11 surgeons, met to walk through the procedure. Gastman and Papay asked Katie’s parents for permission to attempt the full face transplant before proceeding. Robb and Alesia Stubblefield had to weigh what their daughter would want a completely new face, as opposed to just a portion. They decided to go for a full face, and the surgical team went for it. “I knew she wasn’t going to look like her old self anymore with that, but I was still — I was speechless,” Robert Stubblefield said. Katie said she doesn’t remember her life-changing accident. But now, after more than a year of grueling rehab, Katie still has a long way to go. Katie is still adjusting to life with a new nose and lips — and a new outlook. Now 22, she still doesn’t have her vision back, but she said it’s improving. “I think that I see shadows — silhouettes, figures,” she said. Four years after first arriving in Cleveland, the Stubblefields still live in the Ronald McDonald house. Her parents oversee everything with Katie, from her therapy to her anti-rejection medications. But through the ordeal, it’s clear to them that Katie has never lost her essence — and her wicked sense of humor. There are also the extensive medical costs, which are in excess of $1 million. Katie’s operation and much of her care are being covered by the Department of Defense as part of its research to find ways of helping wounded soldiers. Since it’s still an experimental procedure, insurance does not cover any of the costs related to Katie’s face transplant. “The type of wound she had, where it was located, the age factor, is just so classic of what these soldiers go through,” Robb Stubblefield said.